Maxi Rodriguez has signed a three-and-a-half year contract with Liverpool after spending four years with Atletico Madrid. 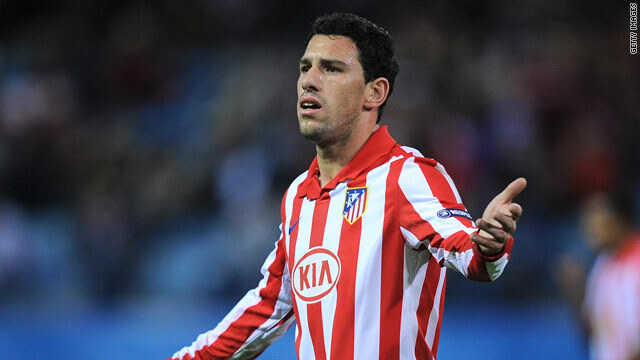 (CNN) -- Liverpool have signed Argentina international Maxi Rodriguez on a free transfer from Atletico Madrid. The 29-year-old winger has penned a three-and-a-half-year deal with Rafael Benitez's side after four years in the Spanish capital. After passing a medical and agreeing terms Rodriguez put pen to paper on the deal, which is subject to international clearance. Manager Rafa Benitez told the club's official Web site. "We were looking for players with character and a good mentality. "He has played for Argentina and Atletico Madrid and is a player with personality. He can play in three positions -- on the right, left or as a second striker -- and is someone with a very positive mentality, which is what we are looking for. He can play in three positions, on the right, left or as a second striker, and is someone with a very positive mentality, which is what we are looking for. "He is comfortable on the ball, can pass and keep possession. He is good at getting into the box and scoring goals and a good finisher. Every year he gets five to 15 goals from the right side of midfield." In other transfer news, Serie A side Fiorentina have agreed terms with Partizan Belgrade to sign promising midfielder Adem Ljajic. The 18-year-old looked poised to sign for Manchester United 12 months ago alongside team-mate Zoran Tosic. Tosic eventually made the move to Old Trafford, but the English Premier League champions decided against signing Ljajic. Meanwhile, Japan international Junichi Inamoto has left Rennes to join J-League side Kawasaki Frontale. The 30-year-old former Arsenal midfielder joined French side Rennes at the beginning of the season but failed to make an impact. Elsewhere, Scottish giants Celtic have trimmed their squad by selling four players in one day, with three going to the same club. Midfielders Barry Robson and Willo Flood and striker Chris Killen have all left Glasgow to be re-united with former manager Gordon Strachan at English Championship side Middlesbrough. Strachan also wanted to sign defender Gary Caldwell, but the Scottish international declined the move to sign a four-and-a-half year deal with Premier League Wigan for an undisclosed fee. There was also a managerial appointment in the English Premier League, with Burnley announcing that Owen Coyle, who left the club last week to join rivals Bolton, and been replaced by former Burnley defender Brian Laws. England: Tottenham forward Roman Pavlyuchenko looks set to end his White Hart Lane nightmare by joining Zenit St Petersburg, according to the Daily Mirror. Italy: Young Roma striker Stefano Okaka appears set to complete a loan move to Fulham next week, claim Tutto Mercato Web. Italy: West Ham midfielder Valon Behrami has been offered to both Roma and Lazio for 15m euros, although neither club can afford the transfer fee, Itasport are reporting.